The Healthcare Information and Management Systems Society (HIMSS) defines nursing informatics (NI) as an area of nursing that integrates nursing science with multiple information management and analytical sciences to identify, define, manage, and communicate data, information, knowledge, and wisdom in nursing practice. The specialty, says HIMSS, supports nurses, consumers, patients, the interprofessional healthcare team, and other stakeholders in their decision-making in all roles and settings to achieve desired outcomes. This support is accomplished through the use of information structures, information processes, and information technology. Informatics nurses are registered nurses (RNs) and most have a master of science in nursing (MSN), a doctor of nursing practice (DNP), or a doctor of philosophy in nursing (PhD). Although a graduate level degree is not always required for informatics nursing, many of today’s top employer’s prefer an advanced degree for new hires. Further, an MSN or higher can help nurses attain higher status in the workplace, greater independence in the field, and higher pay. MSN in nursing informatics programs typically take two years to complete full-time. Sample courses include statistics for evidence-based practice, database management, clinical information systems, health promotion and disease prevention, and leadership development. Programs will also require one or two nursing informatics practicum courses, designed to enhance students’ active participation in a selected informatics role. 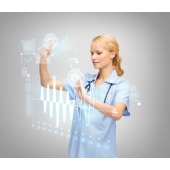 Because the role of nursing informatics in health IT is growing, many top nursing schools have developed competitive programs to meet the demand. Some even offer online delivery, which allows students to work while earning their degree. A few top online options include Western Governors University (MSN: Nursing Informatics), American National University (MSN: Nursing Informaticist), and West Coast University (MSN: Informatics). Completion of these and other top MSN programs in nursing informatics fulfills the requirements for the American Nurses Credentialing Center Nursing (ANCC) Informatics certification exam. If you would like to enter the growing field of nursing informatics, enroll in an MSN program today. We’ve compiled below a list of top online schools for an MSN in nursing informatics to help you get started.